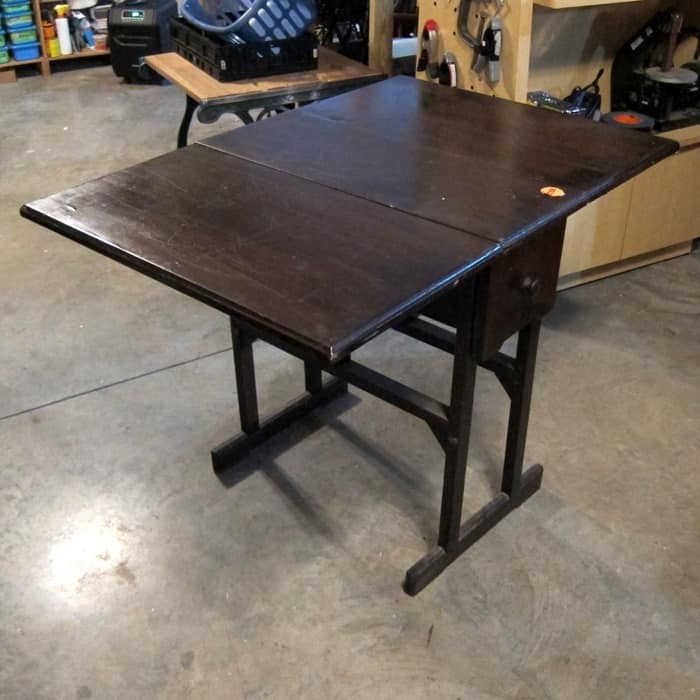 I bought a drop leaf table (maybe handmade) a few days ago. My furniture stash is dwindling down and the table was only $40. I need a plan for it. The JTS bought a box lot of vintage stuff at an auction Sunday and he did good. I’m keeping a lot of the stuff and selling a few things. What do you think of the table? Looks homemade to me but I haven’t checked it out closely. You can tell by the photo above that the underside of the table is not stained. Not a good look because it’s noticeable when the leafs are folded down. The leaf supports work well and the tabletop is level. There are a bunch of dings and dents on the top so I’ll probably play those up when I paint it. 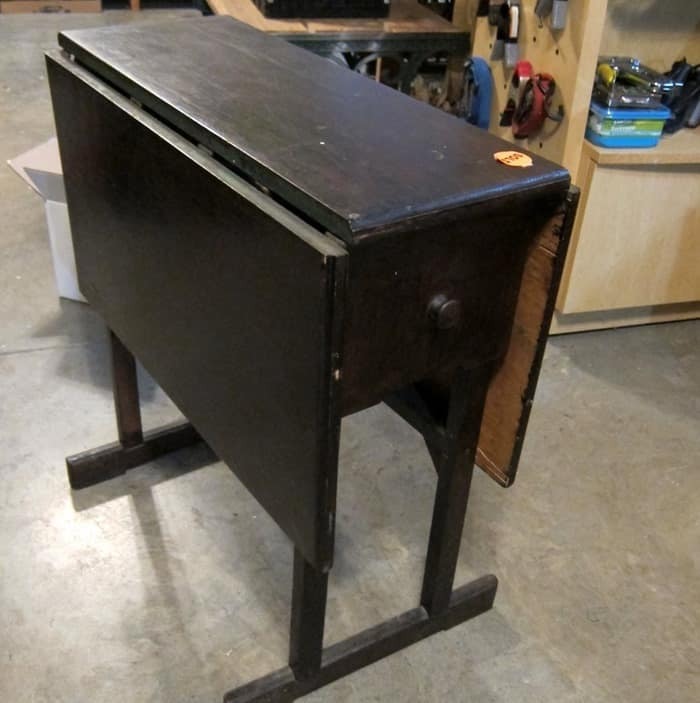 The table has a single drawer on each side. The drawers don’t open and close very well. They will definitely need some work. I just need a paint plan. Any ideas? 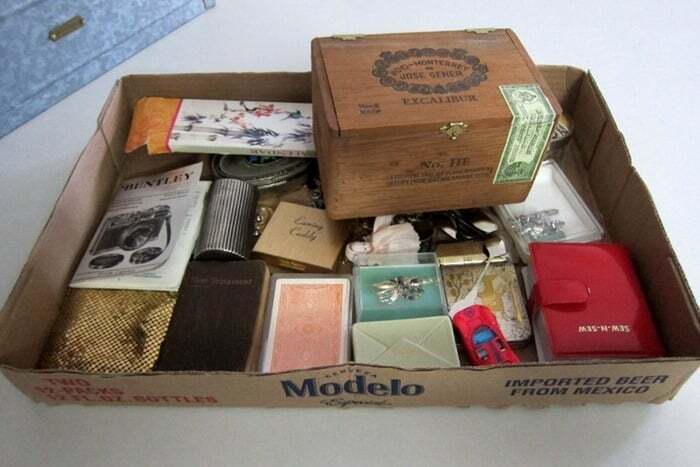 This is the box lot of goodies hubby purchased at the auction. He paid $12.50 for the box of stuff plus a 10% buyer’s premium. Maybe I should ask if you have ever been to an auction. There is usually a buyer’s premium tacked on to the sell price. And you pay sales tax at most auctions. I should video part of an auction one night. We will see! Sharing close-ups of my favorite things from the box lot. The wood cigar box caught my eye right off. The stamp/seal on the right side of the box was coming loose at the edges and I glued it down. I think the seal adds character to the box. 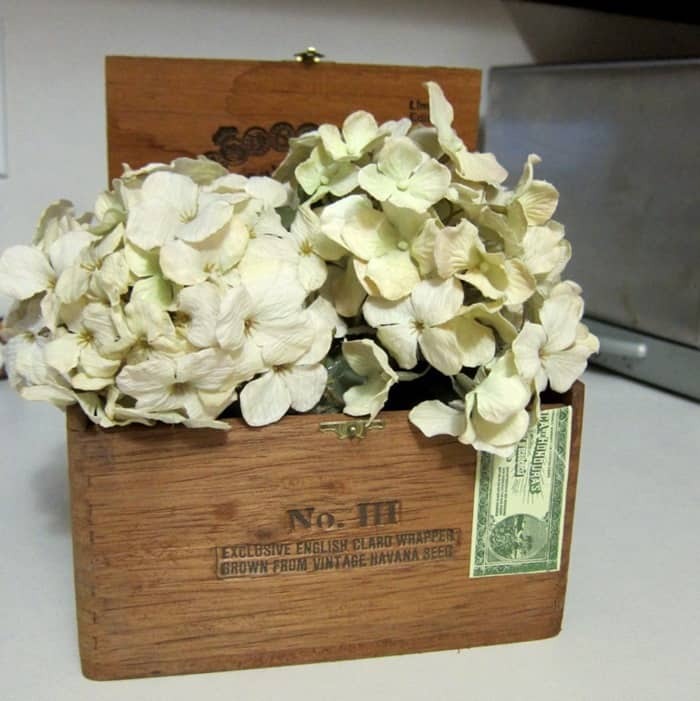 I was setting up a painted table to photograph yesterday and put the artificial hydrangea blooms in the cigar box. I like the look. What about you? I pulled the fake hydrangea blooms out of the original display vase/glass. I bought the flowers in the plastic glass when we lived in Florida and I brought them with us when we moved back to Tennessee. It’s funny what we like isn’t it. I paid $1 for the flowers at a yard sale. 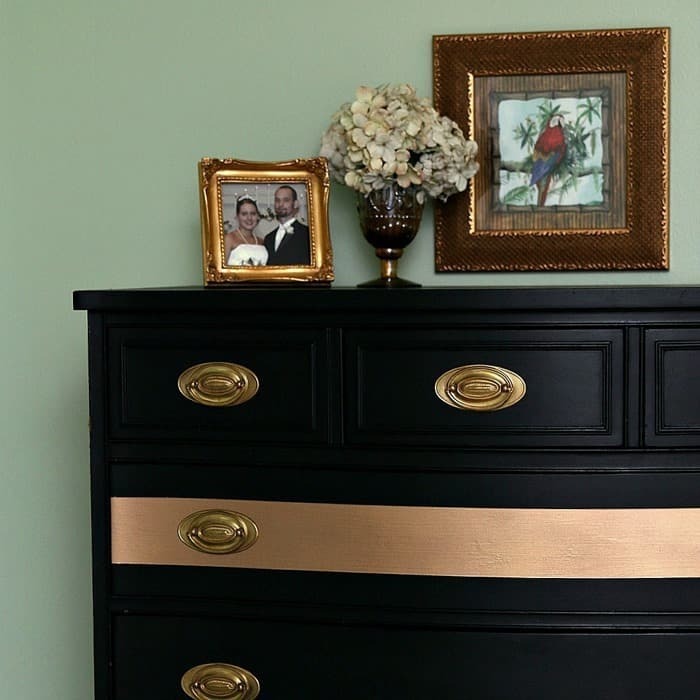 Do you recognize the gold stripe chest I painted almost 2 years ago. I liked the chest so much I had to keep it. It still looks great. These screw back earrings are the prettiest. I tried wearing them but I can’t get those screw backs to work very well. They are either extremely tight and painful or they fall off. I’m still keeping them. 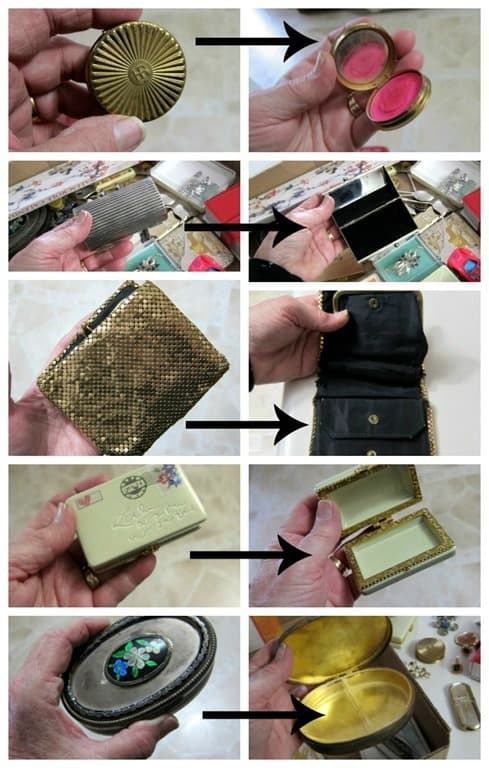 The collage photo above shows a few of the brass cosmetic containers and jewelry boxes. Some of them are scratched up and have broken mirrors. 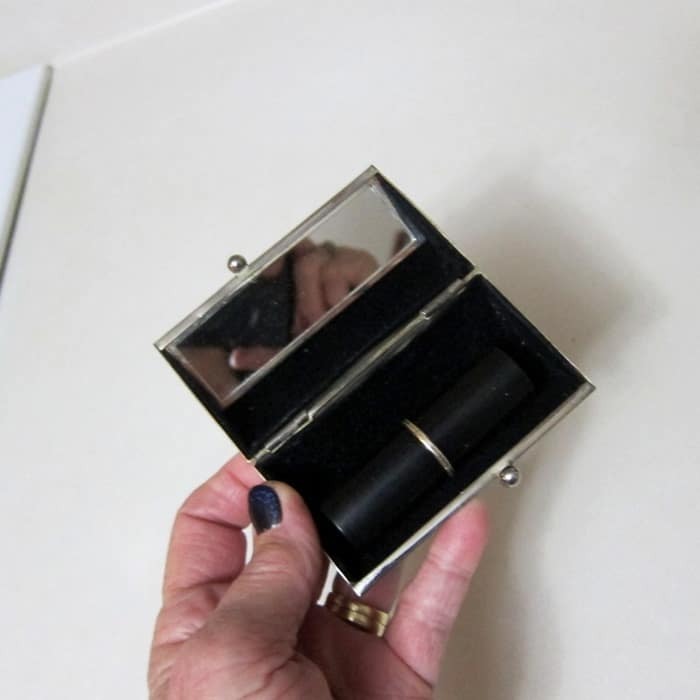 The silver plate lipstick case with mirror was in perfect condition. I polished it up, put my favorite tube (only tube) of lipstick in it, and stowed the case in my purse. 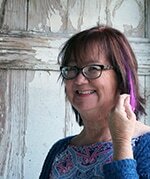 I very seldom wear lipstick but I’m heading to Phoenix for Creativation (craft trade show) today and I might decide to put on a little lipstick…..and I might not. 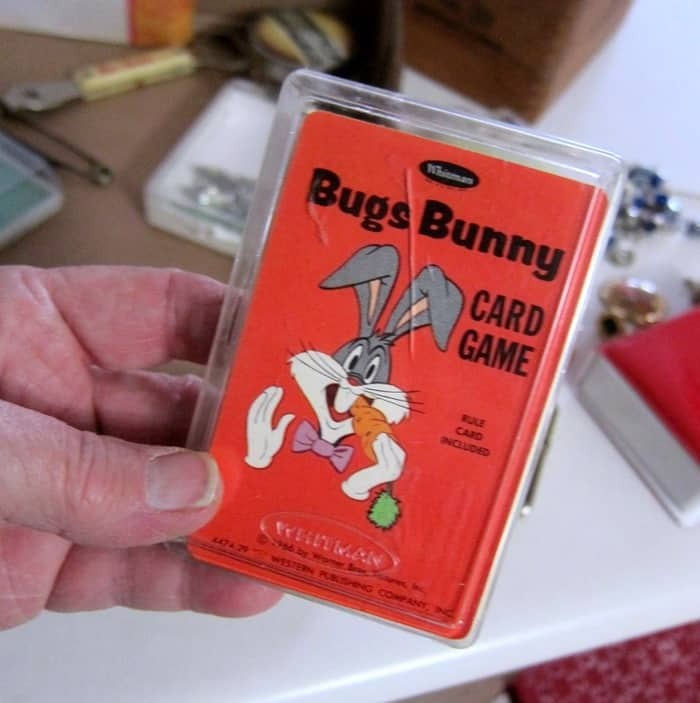 You know I love the Bugs Bunny Card Game because it’s orange. 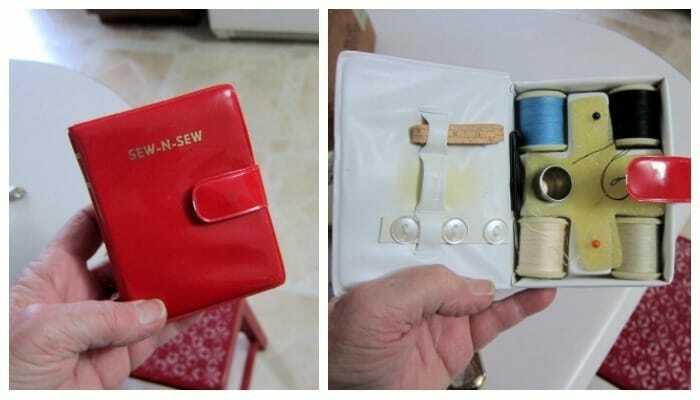 How about the cool sewing kit. I haven’t seen a stainless steel thimble in forever. 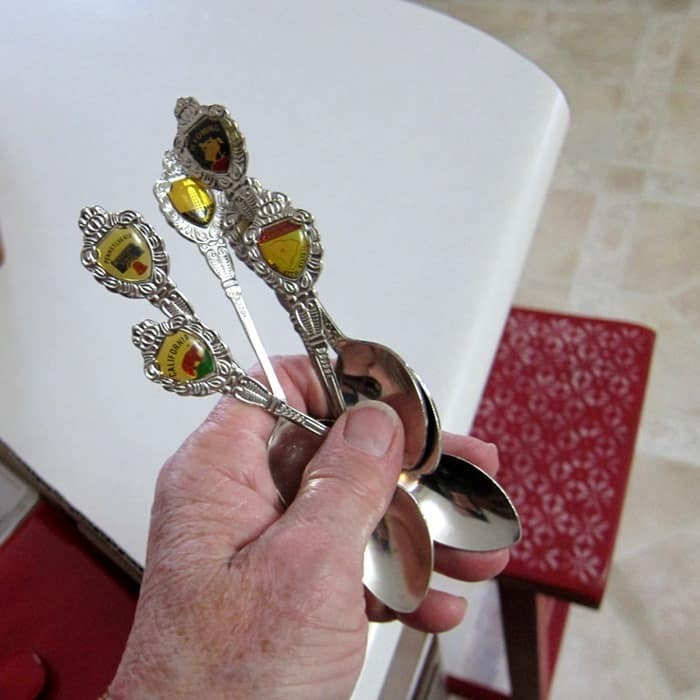 I think the state spoons are collectible. They will probably go to my booth to sell. 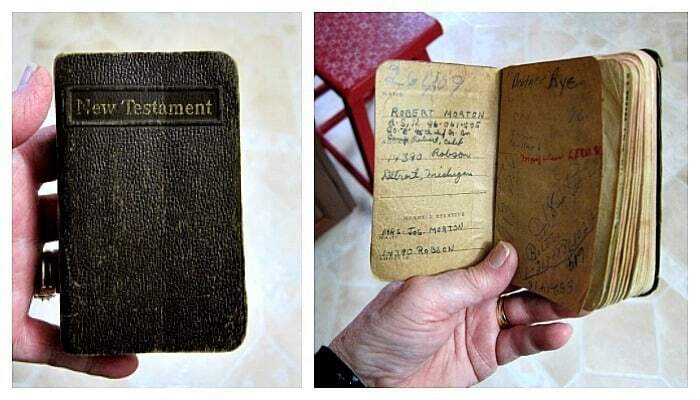 The last thing I want to share is this little pocket Bible. There is a name and address inside and all kinds of notes. It looks like the gentleman carried it while he was in the second World War. I’m going to do a bit of research on the name. That’s it for the auction box lot hubby bought. He did good. What caught your eye? 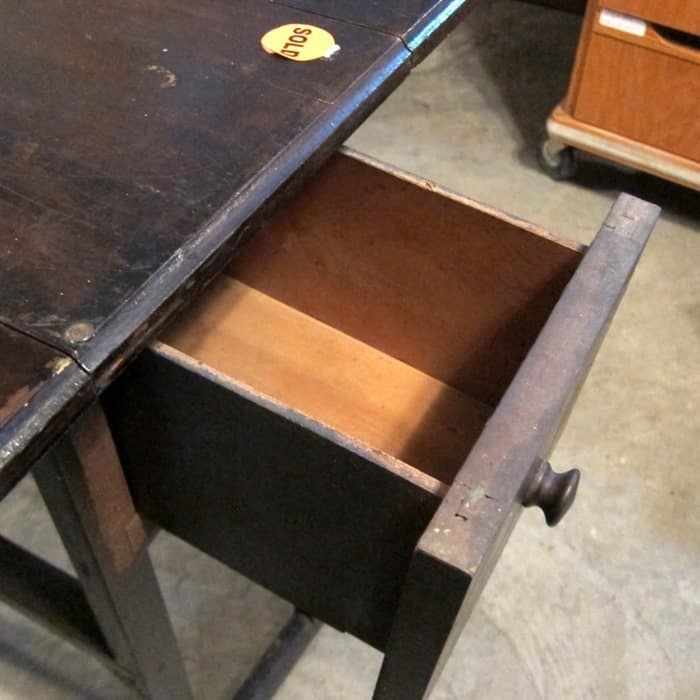 What about paint for the drop leaf table? Have a great time at market. I haven’t been in years. I would take the table top and drop leafs down to a natural wood finish. The rest maybe a green such as MMS Boxwood. Great looking vintage table. Love the table, any fun color. I am on the look out for just that type of table. I have the same problem with the screw on earrings. Love the auction treasures. Thanks for sharing. Well, you know how white improves just about anything, but I’m not sure that is the best treatment for the little table. I really like the table. What a handy thing to pull out and cut cloth on or do projects on and then when finished put the leaves down and it takes up hardly any room. But, gee, I just can’t get a fix on color for it. I’m kind of getting turquoise, but not sure that’s it. You could go with red as I know you love it! I think it sort of depends on what for and/or where you envision using it. Only one definite tho’t: don’t pain it brown! Ha, ha! I see the table in white. Need to remember when the flaps are down, It can become a focal point if painted too bold. I love the table size and style. Perfect for farm house designed home. Whatever color you decide to paint that table, PLEASE paint the inside of the drawers and the under sides of the leafs a beautiful contrasting color!!! I think that would look absolutely freaking AWESOME!!! I used to go to auctions when I lived in S. Calif in the city of Orange. They were exciting and fun. 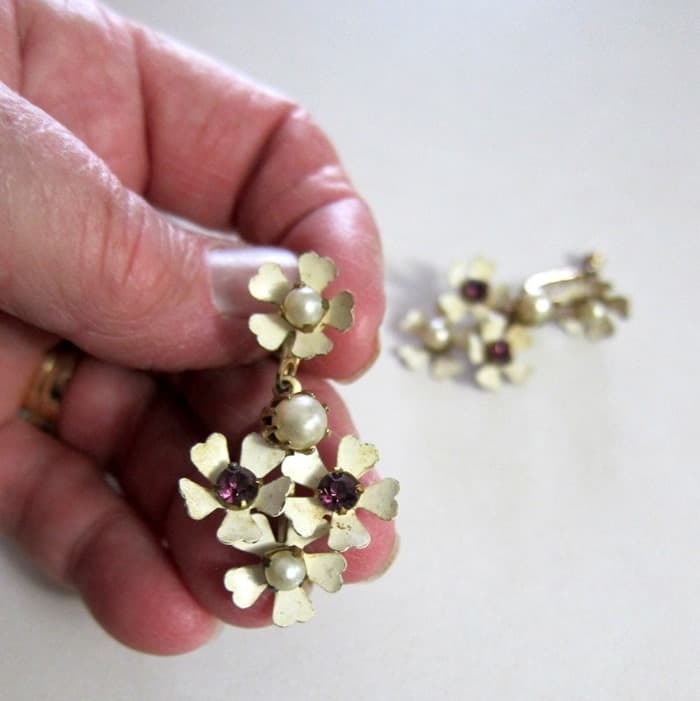 Now they have auctions in Aurora near me and they are also accessed online for bidding! All their bids start at $10. Love the little Love Letter container! Since the table is handmade how about a green with stenciling in a vintage manner for a sun porch or craft/sewing room. A lipstick case really says who you are, but you have to put your purse together so you can find it. 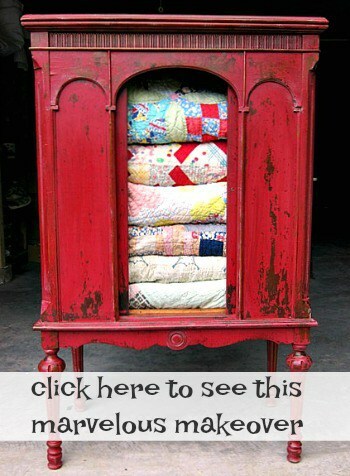 liked seeing your auction treasures! look forward to seeing what you do with them, especially hearing about the journey of the New Testament. I used to go to auctions when I lived in PA. Now I am an estate sale girl. I love your finds! After a quick check, Could this be the man who owned the Bible? I’m sure the family would love to have it. Happy creating and let me know. The name looks like Robert Morton not Horton, to me. I was going to say the same thing about t he earrings. I repair and make jewelry, and it looks like an easy change. You may lose the very top single flower, but I can’t see the back of it to tell. My very first job was at a country auction in a tiny town southwest of San Antonio. As they came in I tagged merchandise, then I sat above the sales as things were sold and sent the buyer’s info into the office by a clothesline type of communication. 🙂 It was one of the coolest things I’ve done. And probably reinforced my love of junk! If the table is homemade, they did a pretty good job of beveling the edge of the table. Very nice! I think any color would be an improvement. Maybe two shades of gray between base and top ? Love the cigar box. I’m a box person. I sold some of my collection recently at a city wide yard sale. So glad there are other box lovers out there! I used to live in PA and love going to auctions. Now I’m an estate sale girl. I love your finds! Could this be the owner of that Bible? Having that Bible back into the hands of family would mean so much. I’ve had great luck with sticky drawers. Just clean, sand top & bottom of sides, then wax them. Candle wax on the runners helps too and lasts longer than furniture wax. Good luck, and I cant wait to see the finished project! Lovely boxful. I spotted a camera instruction book in the hoard – you know it just might be worth putting that on eBay……. The cosmetics containers and the jewelry box for sure! I love older trinkets they just make me happy and I love love auctions! Cool stuff! How about a navy blue with gold accents for the drop leaf table? I know you can update those vintage earrings by jus changing them to pierced. Done that with some of my grandmothers!! Very cool though! Love you sharing your purchases.. Thank you. We love going to Auctions! I mostly go for furniture but you can get some other cool stuff, and sometimes weird, stuff too! It’s always fun going through the boxes! I know that table will be awesome whatever color you do!